I loved the movie. In fact I'm going to read the original version of Little Women, never got around to it in school. My 9 year old daughter and I just finished reading the book and loved the modern adaptation! She was able to understand the changes based on the 150 years time difference but loved the characters as much on the big screen as she did on the pages of this great American Classic! We would watch it again and again! How long before we get a gender-swapped reboot of this classic tale? 5 is how many times I cried both good and bad tears, laughed a lot. 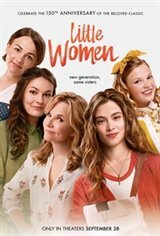 A great genuine story, surprising at parts almost like sisterhood of the traveling pants meets the character development of Steel magnolias.